Your daughter did a wonderful thing, no doubt due the influence of her mother and father and most importantly, the Lord. She doesn't know me, but tell her Brother Moore thinks she's a special daughter of her Heavenly Father. Also, I just finished Tower of Strength. I enjoyed it. Please consider a vote for a Whitney, one of many I'm sure, coming from me. Oh wow. Her hair truly is glorious. And what a sweet girl to want to do that! Your daughter is awesome! And I have to say, I really love her new haircut. That is insanely gorgeous hair. One of the kindest things anyone ever did for us when my mom was sick was offer to cut off her own long, gorgeous locks for a wig because her hair was the same color as my mom's. I will never, ever forget that. What a beautiful, wonderful thing your daughter has done. What a wonderful, caring mommy to have taught her so well to love others. She looks so much more like her older sister with that bob. That is truly beautiful hair. I'm sure it will be greatly appreciated. She looks great. My husband felt sad too when I cut 16 inches of my blonde hair to donate to LoL. Don't worry, it grows back quickly and out there someone will feel better about themselves. It's a blessed thing she did! That is awesome, and she looks great! A lot of kids these days wouldn't think to do something so selfless. Her hair is GORGEOUS!!! That's the color I've always dreamed of having!! She's a way cute kid too! What absolutely GORGEOUS hair! How brave of her to do that! And how nice of you to let her. That would be hard. Heidi has been growing her hair for so long that I'd be heartsick if she cut it, but you're right, it will grow back. She looks very cute with short hair--and older :) What a generous thing to do! She's lovely! And--ack! She looks wayyyy older! I'm very impressed with her generosity. What a great thing she has done. She looks beautiful and all grown up. My 11 yr old daughter did the same thing last year, and her hair is already back to pony tail length this summer. My daughter said Congrats to your daughter on joining the ranks of the precious few, who realize how much hair means to young girls with cancer! What a sweetheart to offer her hair to another girl in need. She is a beautiful child both inside and out! Good Job! I want to thank You for sending the book I won, to my DIL in VA. It arrived while we were there and she was thrilled! She was excited to read it. We were just digging through some boxes and found a ponytail my HUSBAND cut off years ago to send to Locks of Love. (He has the world's most gorgeous hair, dark, curly...and when we lived in L.A. he wore it in a ponytail for years.) Anyway, do you have more info on where to send it? GOOD FOR HER! I was going to say just that...she does look older! K you are not kidding about her hair! So gorgeous!!! Lucky girls. What a good example and thing for her to do! Hey, that last commentor just said almost word for word what I was going to say! Her hair is beautiful. And, yes, as you said, it will grow back. But the bob IS darling! 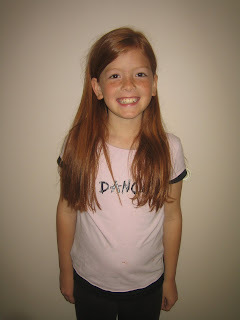 One of my daughters has donated her hair to locks of love 3 times. She'd be beautiful bald (even older looking, yes, but still beautiful). She does look grown up with the bob. She probably likes that, and I'm sure you don't! What a wonderful job you are doing with your children. That their hearts are so big is such a testament to their loving home. She looks darling! Oh, pretty hair! Pretty girl! Evie cut her hair from about that length last summer, and I kept feeling like she looked so much older after, too. That is too cool, and your daughter has beautiful hair with a beautiful face too! Oh wow---that is beautiful hair!! 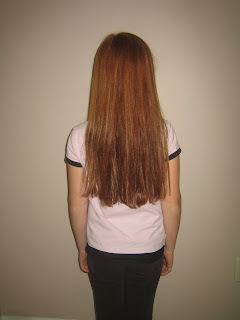 I LOVE read hair---I really want to marry a man that can somehow ensure my children will be red-heads. What a great girl for being willing to donate her hair. I have a tear in my eye and an empathy ache in my heart for you, Annette. What a beautiful thing for your daughter to do---how difficult for you, as Mom, to let her do it. I have donated to Locks of Love a few times, and I love doing it. My hair sure isn't as pretty as hers is though. Way to go!! We love bobs at our house. P.S. Her new 'do is super cute! It's very spunky and fun...perfect for the summertime! What a wonderful gift. Bless her heart. give her a hi-5 for me! SHe is gorgeous, as is her hair. Love the new cut. Hot dang, she's adorableness defined! She looks so great! But she does look older. You can deduct the donation on your taxes next year. Keep that in mind! She is just darling! And she looks so cute with the bob. What a noble cause for her to cut her hair for locks of love!